I was lucky enough to be able to attend the talk given here in Newcastle last night by Jim Fitzpatrick, Australian cycling historian. The hour or so he spent talking to us was packed with information and so well delivered and researched. He has even done a PhD on this subject! Who knew that Australia had such a rich cycling history? 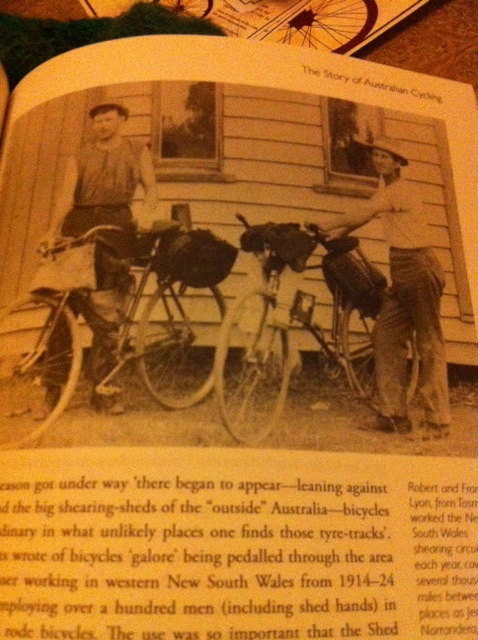 All the iconic moments of Australian history have been interwoven with the use of bikes. From wartime to sheep shearing to goldrushes, bikes were omnipresent and played major roles in shaping how our history panned out. Yet, they are not often mentioned, and one has to look much deeper to find the role they played. The topography (largely flat) and climate (little snow) of Australia has suited bike riding. Jim took great pains to explain to us the size difference between Australia and Europe and that circumnavigating larger Europe (from Turkey to Russia to France and Italy) is only half the distance of Australia’s coast, yet many were able to make this trip in the early days of cycling here. The vast network of bike tracks which connected the Western Australian goldmining towns during the goldrushes was one of the things which defined how things operated there, when towns would spring into existence, thrive and prosper, then die as the gold was mined out and discovered elsewhere. 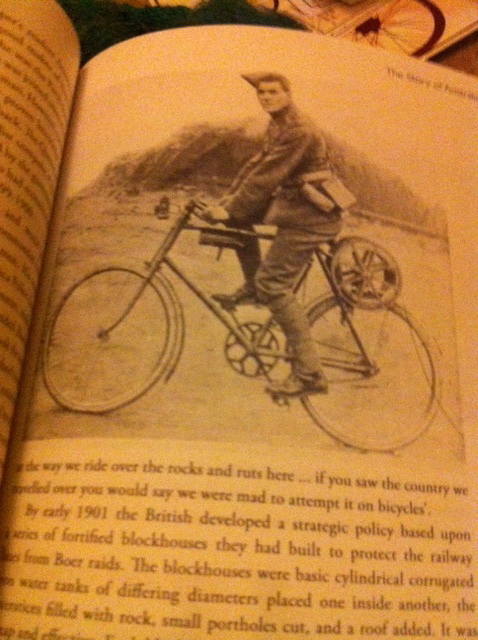 Miners needed to maintain contact with their families back East and paid huge sums for their letters to be delivered by bicycle. I was not going to buy his book, but was seduced into doing so by the vast amount of information and the wonderful vintage photos in it. This review barely touches on all the information he provides, including bike racing, women on bikes, the evolution of bikes and so much more. The number of people there last night is also testimony to the lure of bicycling history. If you love riding bikes, there is something about finding out more about them that is irresistible to bike fanatics. This entry was posted in Uncategorized and tagged bike history, newcastle, vintage. Bookmark the permalink. Great post. Very interesting. Is his book available in the US? One day I will buy “wheeling Matilda” because I like history and I can brush up my English. Very interesting post which illustrates once again how excuses such as “it’s too hot here” are usually the result of a lack of thought rather than any real physical problem. To make cycling accessible to everyone once again, you need to rebuild the “vast network of bike tracks”. That’s the one essential ingredient for mass cycling. In truth, it does get very hot here, I just don’t wear my helmet in summer, far too hot for that! The vast network that was is not needed now where it was, we need to build new tracks in towns and cities and link them to train travel. The distances between our cities are vast and would be a major barrier to all but the most athletic! Thanks for your comment David, I’m a big fan of your blog. 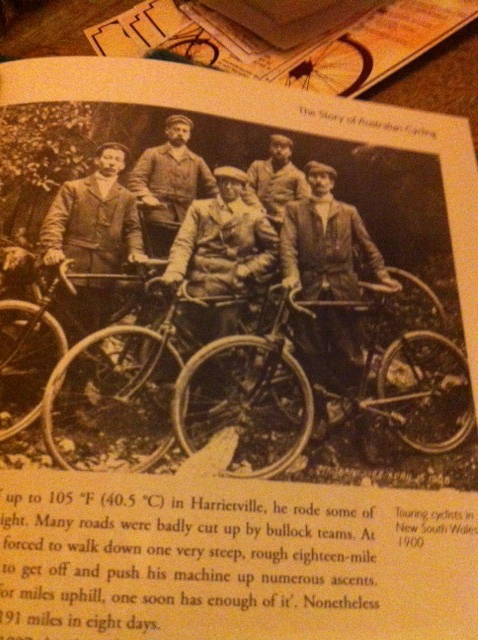 I don’t know the historian, and don’t have any cycling ties. It is by chance whilst browsing that I found this spot on the net. However, I have an autographed cycling history book of very rare edition from a fellow, connected on the family tree. It is the autobiography of Jack Spear Old. born about 1870’d?? dececed about 1962??. He recalls his first sighting of a bicycle and his fascination with one, winning races, etc. He goes on in later chapters ( having perforned service for the Boer War, WW1 and WW2, and then, later in life, rode and rode and rode around Australia, thousands of kilometres: many trips: like across the Nullabor, a weekend away from Melborne to Sydney to ride across this big bridge he heard about that opened in 1932, and home again to work in a munitions factory at the age of 70.. .. ticket tape parades for his arrival into towns.. and much more. I dont know the historian, or whether he knows this man, but I would be pleased to forward some history on.. I give my permission for the moderator to pass on my email address and name to him, if he is interested..